Completed reviews link (all books must be read after 1/1/14). Wow, it's already time for the 2014 one! Time flies! Love this one - signed up again. hope to do better. Hi, I mistakenly posted my blog link to the completed challenge list. Can you please remove it? I loved this challenge last time and am eager to do it again. I just found this challenge, and it sounds great--I'm a huge cozy mystery fan (although I love almost any kind of mystery!). Do we have to choose a level to begin and stick to it, or can we change it during the year to a higher level? Thanks for hosting this challenge! Welcome to the challenge. Yes, you can change during the year. This looks like a lot of fun! Thanks for hosting. 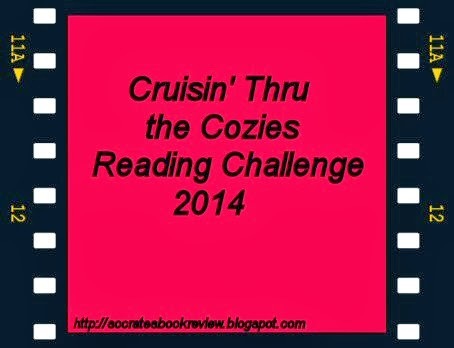 I am excited to find others who have joined to participate in this cozies read challenge. I would say I'm a Snoop most definitely but would probably fit up in Level 2. Sounds like fun :) I'm going for level 4! Can you change levels during the year...say I choose conservatively and go for Level 1-Snoop, then find I'm finishing up my 6th book in March? You can change if you are going to go to a higher level, but you shouldn't go down. Sounds a fun challenge I love reading cozy mysteries. That's why I'm starting at the Snoop Level! 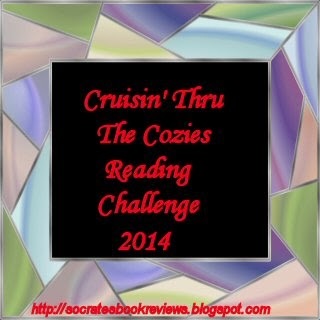 Since I read cozies mysteries, I gave in and joined the challenge. Well, it is only one more challenge, right? I'm in! Excited. Now I can't wait for the new year to begin. I'm in! Can't wait for the new year to begin. I just entered! Thank you for coming up with this! This looks like a lot of fun! Thank you for hosting. I was wondering, are we supposed to add a comment after each book review we post? I've already left a comment after signing up for the challenge, and just posted my first review. Thanks. No, you don't have to comment after each book you review. Just post the link to your review, the way you did. That's fine. My first link is correct too but the name is NOT. Please do remove it! No problem at all. I deleted it. Excited to be joining you this year for the first time. Lots of cozies on my shelves to be read! Just found out about the 2014 CHALLENGE!! Very exciting to be joining all you cozy lovers out there! I'm a voracious reader and gobbled up 129 titles last year!! I just started #15 today - 'While My Pretty One Knits' by Anne Canadeo -- the 1st in the Black Sheep Knitting mystery series, circa 2009.. LET THE READING BEGIN!!!! Just stumbled on this challenge and it looks perfect for me! I'm a little late to the fun but hopefully not too late. Can't wait to read all the other cozy reviews! Sorry, I ended up posting my wrap up link twice. Please delete one. Thanks. And thanks for providing this challenge, I've enjoyed it! Whoo-hoo! Six already, and it's only March! I'm enjoying everyone's reviews, too - I always find a few new series from this challenge. Thank you again for hosting this, Yvonne! I'm up to 9 reviews already, and having great fun! I am quite new to this challenge and this is the first time I have looked at this blog. Is it necessary to have a blog in order to add a link to my reviews etc to the lists here? It would appear so. Hi Susan, Welcome! No, you do not have to have a blog to link up. You can link up to your Goodreads shelf, if you'd like. There's a paragraph above, in the directions, that says what to do if you don't have a blog. We're glad to have you join us! Hi Socrates, are you receiving my links? I have three. Yvonne, thanks for alerting me. I think the link is fixed now. If you have any trouble, let me know. I'm sorry to take up so much time. Thanks for giving the challenge too. I've moved up to the Super Sleuth level....still reading. Hi Socrates, you've been so nice. I'm having so much trouble with the links. I'm going to bow out. I haven't wasted time. I like and would have read the cozies anyway. 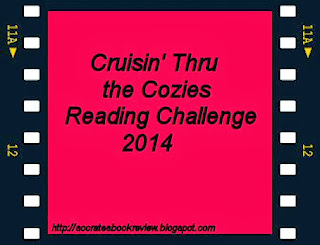 Thanks for giving the Cruisin' Through The Cozies challenge. We'll see each other around on the blogs. I have really had fun and learned so much. Yvonne, I accidentally added one of my mystery reviews (Of Merlot and Murder) to the Wrap-Up Post linkup. I'm sorry - is there any way you can delete it? After I realized my mistake, I added it to the Reviews linkup as well, so it's in the right place - it's just also in the wrong place. Thanks, and my apologies.